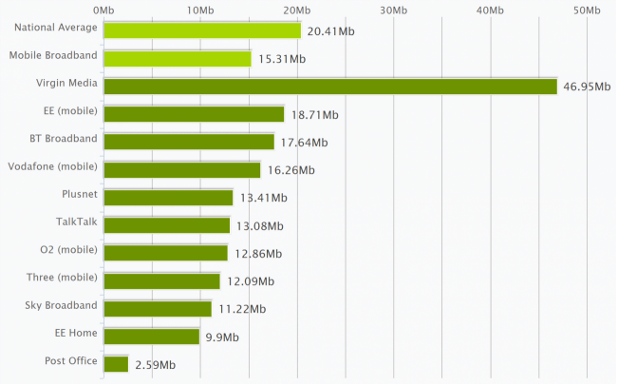 Free Broadband Speed Check| Average UK Download Speeds| click here for more. It is recommended that before taking the test close all other applications that are likely to be using your broadband, this is simply for a more accurate result. If your Computer is plugged directly in to your router rather than Connecting via wireless you are likely to get faster speeds. Click on the "Start Speed test" button, the checker will then begin to first check your Download Speed before then testing your Upload Speed. The test should take around 20-30 seconds to complete, for the most accurate results run the test 3 times to ensure a good average speed is taken. Below are the average broadband speeds for the major UK ISP's IN 2016. This information can be used to see how your results compare. Be aware that speeds can vary greatly around the UK with major cities usually having the higher Broadband speeds, so if your results are comparitively low don't worry it's probably just the area that you are in.